Every Boxing Day, I stock up on half price Lush gift sets. Part of the fun in this is that I get to try products that I probably wouldn't have bought individually and these two- Beautiful Shower Gel and Karma Cream Hand and Body Lotion- are two such examples. The first thing I noticed about Beautiful was its consistency. It's a lot thicker than most of Lush shower gels but not as creamy as their shower creams. When applying, this meant it was a bit "gloopier" than I'd like and I did have a horrible moment where I thought it was going to stain my skin yellow, but thankfully this dispersed once it was lathered up. There's also a shimmer to the shower gel when it's inside the bottle but this doesn't transfer onto the skin. Whether that's a positive or negative is up to you. I couldn't put my finger on the delicate scent at first. It was definitely fruity but sweeter and much more subtle than the usual ingredients. A quick scan of the label revealed that the key notes are peach and apricot. I'm not usually a fan of apricot but when mixed with peach, it gives a lovely fresh scent which is offset with a hint of sensual myrrh. Although I prefer my fragrances to be a bit more powerful, this will be perfect for more sensitive noses. What with my Love and Light and Hemp Hand Protector, I've really been into my hand creams lately. 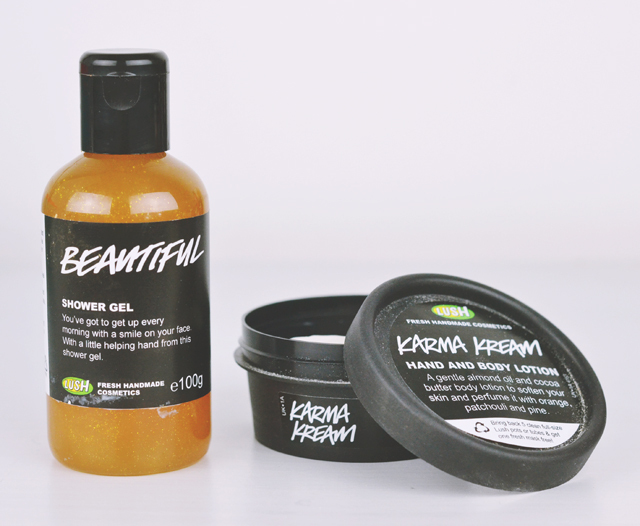 Karma Kream comes in one of Lush's recyclable black pots and has a very light consistency from a blend of almond oil and cocoa butter. As this is not as thick as other hand creams, a little goes a long way and it does go a bit greasy if too much is used. The fragrance is absolutely incredible. Not dissimilar to the love of my life Rub Rub Rub, it combines orange flower, patchouli and pine into a fresh, fruity scent that reminds me a little of cola bottle sweets. That may just be me. As my pot is small at 45g, I haven't used it as a body lotion but can only imagine the delicious, enveloping experience that must be. I absolutely love it! I got these two in the It's Christmas, Deer gift set! Just got round to giving Karma Kream a go and I have to agree, the smell is amazing! I tried a sample of beautifull recently. To me it smelled just like new toys when i was kid. There was something that reminded me of the smell that had new dolls just after unpacking. My mother had similair opinion. I wish to know if more people had similair experience with it.